FoliCal Plus is a high analysis, flowable and rapidly available source of Calcium, now boosted with natural plant elicitors to enhance disease resistance. Calcium is arguably the most important single micronutrient in high production agriculture. Calcium is used to strengthen cell walls and membranes, essential for fruit quality and longer shelf life. 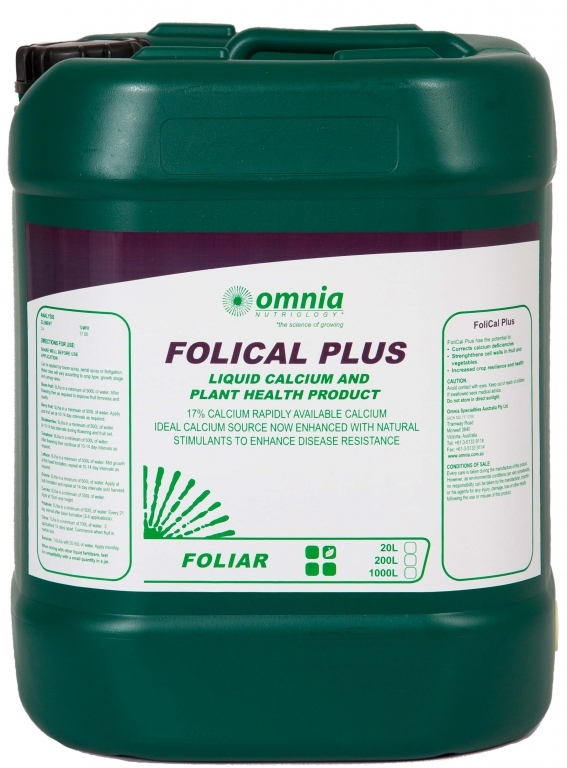 Ensuring that the dividing cells receive all the Calcium they require is a real challenge.FoliCal Plus contains fulvic acid which is a natural chelating agent to assist the plants uptake of Ca. Regular foliar application of FoliCal Plus will alleviate Ca deficiencies due to limited root uptake and slow movement of Ca in mature plant parts. FoliCal Plus boosted with natural plant elicitors will assist the plant in coping with disease and fungal pressure. FoliCal Plus can be applied by boom spray, aerial spray or fertigation. Water rates will vary according to crop type, growth stage and canopy area. Refer to the label for application rates.